Japanese Episode AG 173: "Pokemon Ranger! Deoxys Crisis!! (Part Two)"
American Episode 443: "Pokémon Ranger - Deoxys' Crisis! (Part Two)"
Now that Masato and Nyasu have vanished with Deoxys, our heroes regroup back at the Pokemon Center to figure out what to do next. After reviewing information received from the Ranger Union, Hinata decides that their best bet is to return to the cave where Deoxys' meteorite is located. Meanwhile, Masato and Nyasu find themselves in a pocket dimension created by the DNA pokemon. Deoxys, using Nyasu as its mouthpiece, tells Masato that when it landed on the planet, it thought there would be a great number of pokemon to greet him. However, when Deoxys was unable to find any other pokemon in the area, it decided that there wasn't anyone else on the planet and resigned itself to living inside the dimension it had created for the past ten years. Before long, Satoshi and his friends arrive at the fallen meteor. As Satoshi-tachi's pokemon do battle with Deoxys, the magnetic pressure inside the meteorite reacts with the solar winds from above, causing an explosion that sends everyone outside. As the battle continues, Haruka and Musashi-tachi rescue their companions from the other dimension. After a long battle, Deoxys remains in its Normal Forme long enough for Hinata to capture it! 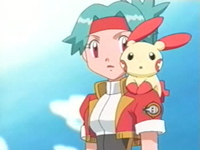 Immediately, she asks the pokemon to use Recover, hoping that the technique will be able to calm Deoxys' fierce heart. Hinata's plan works, and Deoxys announces that it will leave the cave where it had been living for the past ten years to find new friends. As Deoxys leaves our heroes, Masato holds onto the hope that he'll meet his friend again. Ugh. I'm tired of you, Deoxys. I know that's a bad thing to say about a pokemon who's only appeared in a movie and a two-part episode, but I don't care. I'm tired of Deoxys always being "alone" and "needing a friend." Especially in this episode, where its seclusion from the rest of the world is its own damn fault. I mean...it didn't know that there were other pokemon on the planet!? Just because there wasn't this huge welcoming party for you when you crashed on the planet, you assumed that you were all alone? GOD. I do, however, like the rest of the episode. The little pocket dimension Deoxys locked itself in is pretty funny (if you think Spaghetti-O's and packing peanuts are funny), and the fact that Ohsubame actually gets to fight a friggin' legendary pokemon shows just how far bird pokemon have gone since the days when all Yorunozuku did was pop Nyasu balloons. 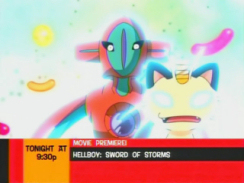 Gotta love Meowth's face during CN's promotion of the Hellboy movie. Solana: "We may not know what's wrong, but still, there is no doubt that there is something wrong. And we've got to help! If Recover is successful, then hopefully Deoxys will return back to normal." After the sound of the explosion / earthquake / whatever, the camera, in the Japanese version, starts to shake and continues to do so in every shot until the gang gets blown out of the cave. In the English version, the camera doesn't shake at all. For whatever reason, PUSA decided to edit the scenes so that the camera remains perfectly still as the meteorite causes all the carnage. The same edit takes place later in the episode after Solana's "Air pressure's dropping still...you all better hold on tight!" and continues until Hinata successfully captures Deoxys. It's possible that the edit was due to the masters PUSA was given (I haven't had a chance to check the Japanese DVD release of these episodes), but I somehow doubt it. The TO BE CONTINUED... screen is three seconds longer in the dub than it is in the Japanese version. This time, Pokémon USA has the screen fade to black while the words TO BE CONTINUED... remain on the screen, so it looks like they're trying to make those last few seconds seem less awkward.